Dental emergencies can be sudden, startling events. If you or a loved one is experiencing a traumatic injury or severe oral pain, the most important first step is to not panic. Then, pick up the phone and reach out to Dr. Catherine Cech and her team here in Manchester Center right away! We’ll see current patients as soon as possible for emergency assistance, and new patients will be accommodated with their own appointment when feasible. Assistance can also be provided over the phone in regards to first aid and whether or not an emergency room visit is necessary. 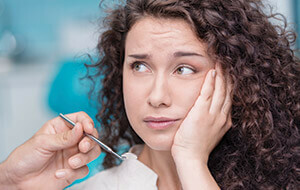 There are several steps you can take to reduce your risk of experiencing a dental emergency. Always attend routine check-ups and cleanings every six months – by allowing Dr. Cech to inspect your oral health at these intervals, our team can keep small problems that exist today from becoming the dental emergencies of tomorrow. Additionally, limit your intake of particularly hard or sticky foods, don’t chew on the ice in your drink, and use scissors instead of your own teeth to open difficult packaging. Also, make sure to wear a custom mouthguard if you suffer from bruxism/TMJ problems or if you participate in a sport where physical contact is possible. Are you experiencing heavy oral bleeding or a possibly broken jaw? We strongly recommend going to your nearest emergency room right away. After you’ve recovered, our team can then provide reconstructive care for rebuilding your smile and treating any damaged and/or lost teeth you suffered in the incident. Contact us today to schedule your first appointment! Patients from Stratton, VT and surrounding areas are always welcomed.